Is Hungary the Financial Crisis' Next Iceland? A rumor briefly circulated Hungary a few weeks ago: things were so bad, it went, that the government intends to freeze bank accounts. The government repeatedly assured Hungarians that the rumor was groundless. But so deep is the current economic malaise gripping the country that thousands of people were taken in. That mounting pressure pushed Prime Minister Ferenc Gyurcsany to announce Saturday that he would step down. At first, friends and enemies alike wondered if it was a trick by the wily politician to bolster the besieged government. But on Monday Gyurcsany said his resignation was permanent. "I hear that I am the obstacle to the cooperation required for changes," he reportedly stated at a congress of his Socialist party (MSzP) over the weekend. "If so, then I am eliminating this obstacle now." At one point, analysts declared the reform process dead. 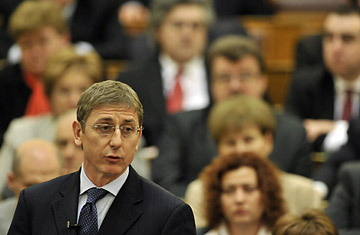 But before his resignation, Prime Minister Gyurcsany proposed a new package in response to the financial crisis. Again, critics dismissed this plan as too little too late. Krisztian Szabados of the Budapest-based think tank Political Capital called it "weak" for not going "far enough" in cutting spending and taxes. The winner in the current standoff, if there is one, may be the departing Gyurcsany, who retains a measure of power after orchestrating his re-election as MSzP party chairman over the weekend. He may be the most unpopular man in Hungary right now but Gyurcsany's opponents may regret his departure.